As we approach 2017, I find that I am not as optimistic as I normally am when approaching a new year. Regardless of who you supported, we concluded the election more divided than when it began. The result has been a significant increase in hate crimes and harassment as underlying prejudices surfaced. The Bender JCC’s core values include “chesed” – helping those in need through acts of loving kindness. As a JCC, we must take a stand for community in its broadest sense. Let’s reach out and fight hatred and intolerance with acts of intentional kindness. 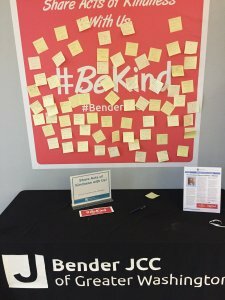 We invite everyone in our community of all backgrounds, religions, abilities and sexual orientations to join all of us at the Bender JCC and embrace the diversity of our community and treat our neighbors with civility, decency and kindness by participating in a #BeKind campaign from December 1 through Inauguration Day (January 20, 2017). Use the hashtags #BeKind and #BenderJCC to share your comments, photos and videos on Facebook or Twitter and don’t forget to tag us @BenderJCC. If you are not a social media user, use “Post-it Notes” to share what you see or think on the poster in the lobby of the Bender JCC. We will post these comments online for you. Email videos, photos and acts of kindness to marketing@benderjccgw.org. Check out our #BeKind board in the lobby! Grab a post-it note and write an example of how you’ve shared kindness! Sue Kleit (a member of our Marketing team) gave me her son’s old train set so my son, Brady, will be able to play with it. Give shelter and food to the needy. Kindness is having my JCC locker room & spin friends support me with my grief over losing a parent.